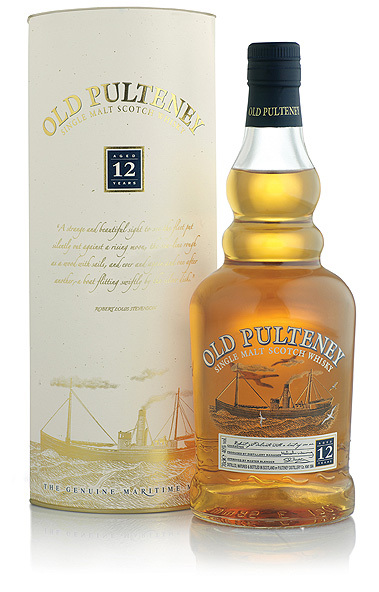 Pulteneytown in Wick, Caithness, was once known for two things: herring and whisky. Once the largest herring port in Europe, the town mostly known for its oily, salty, honeyed, malty distilled spirit. Seems as if creamed herring doesn't sell like it used to. But whisky certainly does! The distillery, built in 1826, has changed hands at least six times, ultimately landing in Inver House's portfolio (along with Balblair, Speyburn, and Knockdhu). That fun bulby bottle neck probably-not-so-coincidentally looks like their pot still with its big ol' boil ball. Their steel washbacks are still good shape after 90+ years, and they are one of the few distilleries to use a dry yeast during fermentation. These are the sort of factors that go into shaping their classic spirit. In the US, the 12yr is bottled at 43%. It's been bottled at both 40 and 43 in the UK, though currently sits at 40%. Count me happy that we're getting the bolder stuff. I was very lucky to score a 375mL bottle of OP12 as part of a gift pack a couple months ago. I opened the bottle two weeks ago, it's now half full. It has become a solid go-to during this crazy heat spell of ours. It's color is a light gold with some slight yellow-green hues, so I doubt there's much colorant added. The nose is very spirity, lighter on the oak up front. Seaside and brine. Buttercreme frosting. Some pencil notes sneak in later on. The palate is vanilla-first. Then salted angel food cake. Dry, malty, and with a touch of wood smoke. Much sweeter on the finish. Lots of vanilla and malt. There's a little barrel wood with faint hints of fresh cherries and apricots. Ripe apples rush into the nose. Lots of vanillins from the American oak. Most of the brine has been washed away. The palate is much creamier and sweeter. Peals of vanilla. Wood grain. Some sort of cream dessert wine. It finishes woody, more vanilla. Basically the barrel. With water added it goes from an aperitif to a dessert (though I prefer it neat). I was pleasantly surprised by this one. It's very moreish and that's its key. It won't win over fans through complexity. But its drinkability makes for a very nice step up from Glenfiddich 12 and Glenlivet 12. Does sound like a tasty one. I'm still kicking myself for not buying a bottle when it was on sale in OR. Oh well, there's always Hi-Time. Yeah, last I checked Hi Time had it for $29.99. Perfect price for it. This whisky is not for beginners. When Ralfy reviewed OP12, there was one commenter who disagreed with the high score (which is actually unusual for a Ralfy review). Ralfy noted in his reply that the sweet and salty notes aren't for everyone. Hey Eric! Yeah, I saw that comment on Ralfy's review. I wonder if a sour fruit note stirred up some trouble. I wouldn't recommend OP12 as a first (or second or third) whisky. I'll admit it's not the easiest of malts. But it's not the toughest either. When it comes to suggesting a starter classic Highland character, I have a hard time recommending Oban 14 because I don't feel comfortable pushing a $70 starter whisky. But OP12 can be found for $30 and isn't too hard to track down. I recently picked up a fresh bottle of OP12 to check if the whisky has changed and thankfully it is still consistent. However I'm now preferring OP12 with a drop of water because the sweetness fits with my taste preferences. It's really interesting how water completely changes the flavor profile but I think this is characteristic of North Highland malts. Also I think I want to try pairing this with herring. There's a whole Bowmore with oysters thing going on out here in LA. I like herring better than oysters (due to childhood memories of herring at NY delis), so this sounds like a good pairing. I'm glad OP12 has remained consistent. I don't know if this is true up by you, but Trader Joe's has the best price on it down here.